Palladium was discovered in 1802 and is member of the platinum group. It is widely used as a catalytic converter in automobile fuel industry. Palladium was discovered by William Hyde Wollaston in 1802. The element was named after the Greek goddess Athena, who slew a giant (according to one myth) named Pallas and wore his skin as her gown. The name palladion was given to the statue of Athena that was believed to have talismanic properties to keep the kingdom (Troy) safe. Pallas was also the name of an asteroid that was discovered in 1802, so Wollaston gave the newly discovered element the name palladium . Palladium is a rare metal. 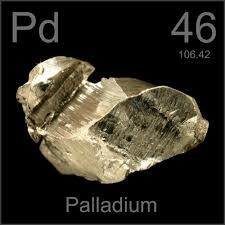 the minerals and ores of palladium are not very common in the earth’s crust. Palladium is found in the alloy form with gold and other metals of the platinum group. Commercially, palladium is produced by nickel-copper deposits that are found in Ontario and Siberia. Palladium is also present in form of rare minerals such as polarite and cooperite. The largest producers of palladium include South Africa, Canada and Russia, where large natural deposits of palladium are present . Palladium is silvery white transition metal. It has a shiny appearance and is soft and ductile in nature. Palladium belong to the group of exquisite metals (including rhodium, platinum, osmium, ruthenium, osmium and iridium) termed as the platinum group metals (PGMs). Palladium is a heavy metal and has a density of 12.03 g/cm3. In liquid form, palladium has a density of 10.38, which makes it a dense liquid. But palladium is less dense in both states as compared to other metals of PGM group. Palladium also have the lowest melting point among the elements of its group. Palladium is not a reactive element. It is dissolved in concentrated sulfuric and nitric acid, but the reaction is quite slow. N powdered form, palladium dissolves in hydrochloric acid. Palladium readily dissolved in aqua regia at room temperature . At standard temperature, palladium does not react with oxygen and that is why is resistant to tarnishing in air. At higher temperature, around 800C, palladium reacts with oxygen and forms a tarnished layer of palladium oxide on the surface. The most common oxidation states of palladium are 0 and +2. Palladium compounds resembles compounds of platinum. It reacts with halogens to form halides, and the common halide is palladium (II) chloride. Palladium chloride dissolves in a mixture of nitric acid and acetic acid to form palladium acetate. A large amount of palladium is used in the catalytic conversion of harmful gases from automobile exhaust, carbon monoxide and hydrocarbon into less harmful gasses, such as nitrogen, carbon dioxide and water. Palladium is widely used to make fuel cells, where it reacts with hydrogen and oxygen to produce electricity, along with heat and water. Palladium is used in electronic industry and in making watches. Palladium is used for various medical and dentistry purposes. Palladium is used in making ornaments and jewellery. Palladium is a moderately toxic metal. and high dose of this element can be very dangerous, for animals and plants. Some experiments reflect the carcinogenic nature of palladium. However, little evidence is present regarding the toxic effects of palladium on humans. In mice, however, the median lethal dose of soluble palladium has been estimated to be an intravenous dose of 5mg/kg and an oral does 200mg/ kg .
. Hammond, C. R. (2004). “The Elements”. Handbook of Chemistry and Physics (81st ed.). CRC press. ISBN978-0-8493-0485-9.
. “Platinum-Group Metals” (PDF). Mineral Commodity Summaries. United States Geological Survey. January 2007.
. Hammond, C. R. (2004). “The Elements”. Handbook of Chemistry and Physics (81st ed.). CRC press. ISBN 978-0-8493-0485-9.